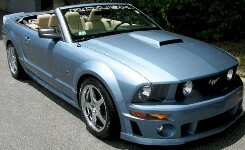 Roush Performance Products offered both performance parts and turn-key Mustang conversions. Three upgrade packages are the Stage 1, Stage 2, and Stage 3. The Stage 3 offers 415hp and 385 lb-ft of torque in its intercooled ROUSHcharged and tuned 4.6L, 3-valve V8 engine. Also offered is the seven piece body kit, suspension upgrades, 18 inch wheels, custom leather interior, and Roush gauges just to name a few.